After the last of October's beauty dies away, the increasingly dark days and gloomy weather of November always bring me down. The one redeeming thing about November is that we start using our woodstove a lot more which makes our house blissfully cozy. I recently read an article on the Danish art of hygge, which translates roughly to "coziness of the soul". Despite their long and dark winters, the Danish have lower rates of depression than other industrialized countries, and this article suggested that making hygge a priority might be one of the contributing factors for their collective happiness. I like the idea that treasuring all that is warm and cozy - like mulled wine, cozy quilts, dinner at home with friends, and reading a good book in front of the fire - is good for my mental health. These are some of the books that could teach us all a thing or two about the art of living Danishly. The year of living Danishly : uncovering the secrets of the world's happiest country is a memoir by Helen Russell, a Londoner transplanted to rural Denmark for a year. She attempts to find out why Danes rate themselves happier than citizens of any other country. Besides having a whole chapter devoted to the concept of hygge, the book explores various aspects of Danish culture: "From childcare, education, food and interior design to SAD, taxes, sexism and an unfortunate predilection for burning witches, this is a funny, poignant record of a journey that shows us where the Danes get it right, where they get it wrong, and how we might just benefit from living a little more Danishly ourselves." Publisher. How to be Danish : a journey to the cultural heart of Denmark by Patrick Kingsley is another British book about Denmark that attempts to uncover why Danes are reputedly the happiest people in the world. This book focuses a lot more on the pop culture exports from Denmark, especially dark TV dramas such as The Killing, The Bridge and Borgen, and is written in a breezy travel guide style. "Part reportage, part travelogue, How to be Danish is an attempt to fill in some of the gaps - an introduction to contemporary Danish culture that spans television, food, design, architecture, politics, and race." Publisher. I'm not personally planning to get to Denmark any time soon, but I'm still going to cultivate my own hygge right here at home. Here are my top pics to cultivate your cozy this winter! 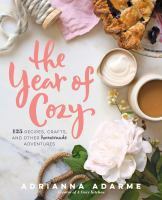 The Year of Cozy: 12 Months of Creature Comfort by Adrianna Adarme is a new book that I intend to study closely in the next few months. "Like her blog, A Cozy Kitchen, The Year of Cozy features stunning photography and Adarme's friendly voice. Adarme gives us special (but totally doable) things we can do for others and ourselves. From recipes to DIY crafts, Adarme focuses on easy, inexpensive undertakings that have a big reward: happiness. The best moments in life don't require stuff, they just require intention." Publisher. Nothing's more cozy than a hot toddy on a cold and rainy night. 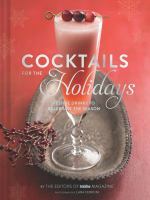 Cocktails for the holidays : Festive Drinks to Celebrate the Season by the editors of Imbibe magazine has an entire chapter on warm boozy drinks, in addition to tons of fancy cocktail recipes for your holiday parties this season. Coziness can make the winter pass more comfortably, but eating and drinking obviously only go so far to help you if you are actually suffering from seasonal depression. Winter Blues : Everything You Need to Know to Beat Seasonal Affective Disorder by Norman E. Rosenthal describes and suggests treatment for the winter blues. Many mild cases of SAD can be treated with light therapy, which can sometimes be as simple as regularly going outside for a winter walk whether or not the sun is shining.